determine whether to continue with that network or look for a better one. And that's were Ookla Speedtest comes in. Whenever i move to a new location and needs to purchase a data plan to connect to the internet, knowing the best network with a strong 3G or 3.75G was always a problem but not anymore since i can now use this application to check it out for myself. 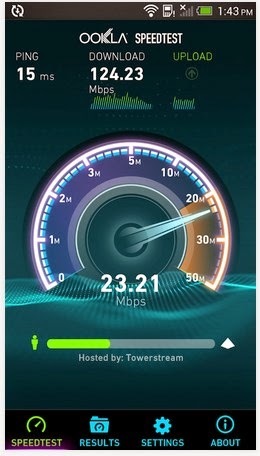 With just one click, Ookla speedtest will give you detailed report on your download and upload speed. It is easy to use and can even give you real time data for you to see how stable your internet network is.